Why should we only address important issues when we are assigned to do so? That’s why we’ve created our Thinking Ahead-Projects. 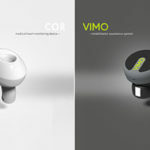 Part 1 already featured as a blog post in-ear wearables last year. 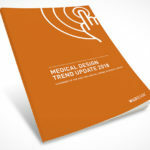 As medical designers, we deal with a wide variety of issues. Which technologies will shape the future? What user needs will play a role? What problems will we face? How will technology and digitalization change the medical sector? In order to find answers and identify the right questions – during their time here at Wilddesign our interns deal with exactly these. Our new series of articles will gradually introduce some of these works: The second “thinking ahead-project” is about the medical design project ARCO by design student Ana Kahl Bulnes – a concept that deals with the future of hospital beds and the environment that is so important for patients. The idea of the project was to make the everyday life of in-patients in hospitals easier and more pleasant and thus improve their quality of life during their stay. Ana picked out the patient bedside table as an object for closer examination. Initially, the concept was developed with the aim of analysing the patients’ everyday hospital life. What does their daily routine look like, what are their needs and how do they cope with the rather monotonous everyday life? The analysis showed that there are different usage scenarios for a patient bedside table and that the current product solutions only deal with little to no of them. It was also noticeable that the usage scenarios have changed over the last few years as a result of digitization. An exciting field, therefore, which also drove Ana to deal with this topic in more detail and to formulate a suitable solution here. Which core requirements have to be solved? 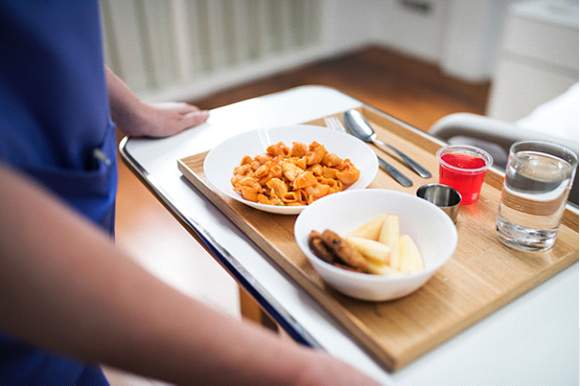 In addition to everyday routines such as taking meals, nursing and visits, the time in between is crucial for patients. In our modern fully digitalized world, the use of technical devices such as smartphones, laptops or tablets plays a decisive role even while in hospital, but how is the problem of power supply solved and what are the requirements for the environment? Other aspects included the storage of personal belongings, hygiene and waste disposal. As patients are usually restricted in their mobility, accessibility and logistics are the greatest challenges. 2. Must contribute to a better hygiene. Materials that are easy to clean. 3. Easy access to sockets and objects. 4. sufficient space and ease of use. This includes, for example, storage space for electronic equipment, technical interfaces, storage facilities for bottles and an integrated waste bin. 5. should be aesthetic and tidy, because the patient bedside table embodies the “temporary living room” for the patient. 1) The independent concept in which the patient bedside table stands on its own foot and can be moved freely in space by casters. 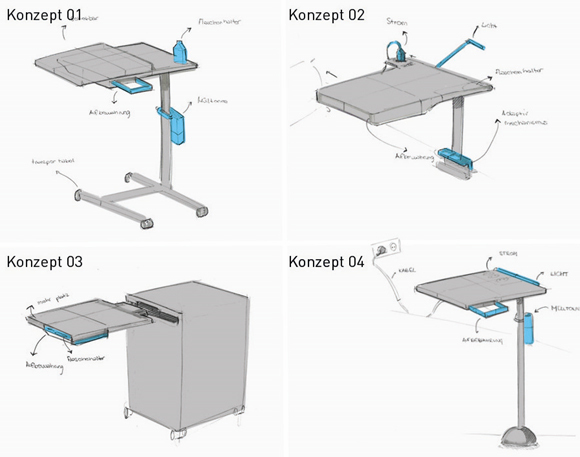 2. the adaptive concept, in which the patient bedside table is mounted on the bed in a suitable position. 3. the furniture concept, a movable cupboard with the possibility of having the table disappear completely into it. 4 The fixed concept: The table also stands on one foot, but without the possibility to move it. Finally, the adaptive concept 02 was implemented, as it comprehensively meets the requirements. 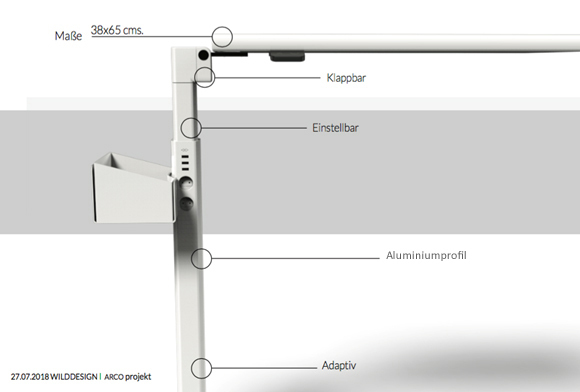 Thanks to the adaptive mechanism, it can be moved flexibly – both in terms of height and lateral positioning. The distance to the patient can also be individually adjusted. Light and power connections can be integrated. For optimal positioning on the bed, Ana has studied different types of manufacturers and their models. This resulted in three concepts: The adaptive mechanism can either run on rails, be extendable or can be plugged together. Above all, the design details should be self-explanatory, simple and precise. The optimal dimensions were 65 cm x 38 cm. The table is foldable, height-adjustable by a telescopic mechanism and is made of lightweight TSG (thermo foam casting) material. To ensure functionality, all joints have a high degree of freedom, are space-saving and guarantee the greatest possible accessibility. The table can be folded upwards or downwards. It also has a handle to facilitate positioning and is electrically height-adjustable by means of a lever. The patient bedside table also has additional modules that provide sufficient storage space for personal items and technical interfaces such as several USB ports and sockets, which are also easily accessible from the bed. 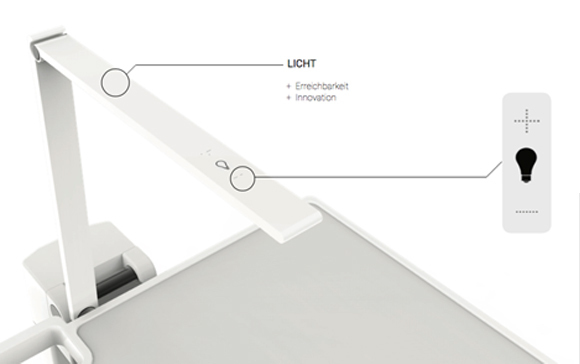 The light is located on a flat arm that can be folded down next to the table. 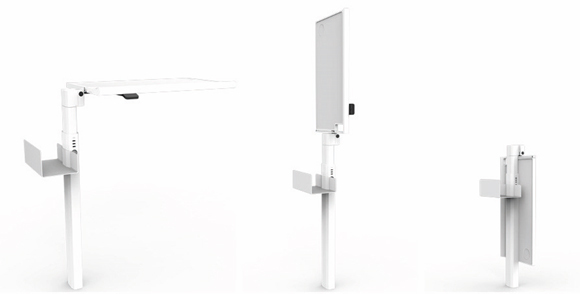 When folded out, the lamp is located directly above the table and can be operated and adjusted using the sensor button on the top of the arm. 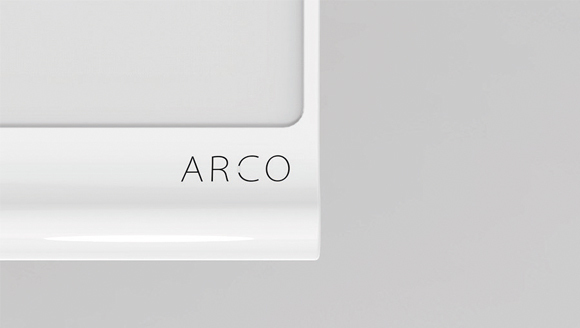 The ARCO concept therefore comprehensively addresses the needs of patients and ensures a more comfortable everyday life in the hospital. Thanks to its flexible adjustability, it can be positioned individually for any purpose and also offers additional convenience thanks to lighting and power options. Thanks to its integrated waste bin and easy-care material, it reduces germs and bacteria and contributes to hygiene. Congratulations to Ana on this good Think Ahead-Project. If you like this concept or single aspects of it, or if you think we should continue working on it, please let us know. We look forward to receiving your feedback at vordenker-projekte@wilddesign.de or via the e-mail button below. 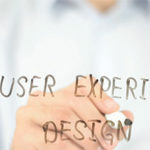 The user – the driving force for product innovation? Saving Silver – Hip protection for elderly people. Ana is a design student and was an intern for half a year in Munich. She is always interested in new challenges and loves to discover new cultures.